The mining ship Red Dwarf, five miles long and three miles wide, is making its way through the outer Solar system on a mission to process and refine ore. It's not a particularly compelling job, but Third Technician Dave Lister entertains himself by slobbing out, partying with his friends in the rec rooms and making life a misery for his boss and room-mate, the wound-up, arrogant, ambitious and spectacularly incompetent Arnold J. Rimmer. Lister's fortunes take a turn for the worse when the captain learns he has sneaked a pregnant cat on board in violation of quarantine (cunningly discovered when Lister sent a picture of himself and the cat to be developed in the ship's lab). Unwilling to let his cat be killed and dissected, Lister agrees to forfeit 18 months pay and spend the rest of the trip in stasis. Of course, when Lister wakes up he discovers some complications ensued whilst he was in temporal stasis. A lethal radiation leak wiped out the crew and the ship's computer, Holly, set course for deep space to avoid exposing anyone else to radiation poisoning. However, he had to wait for the radiation to die down to a safe background level before he could release Lister. Unfortunately, this has taken three million years. As Red Dwarf starts its long journey home, Lister discovers that the only other lifeforms on board are a holographic recreation of Rimmer, created by Holly to 'keep him sane', and a humanoid lifeform who descended and evolved from Lister's cat. Red Dwarf bears the honour of being the greatest SF sitcom ever made. True, this isn't exactly a difficult achievement (apart from Futurama nothing else is really even on the same radar as Red Dwarf), but nonetheless it is a notable one. It is also fair to say that the show took a good year or so to get into its stride, and watching this first season again twenty-one years on is a bit of a mixed bag. On one level most of the ingredients of its later greatness are there and there are some excellent ideas and gags, but on another the show is hamstrung by insanely low production values and a lack of experience on the part of its main cast, resulting in a series that is quite variable in quality. The first episode, cunningly entitled The End, sets up the basic premise and does so quite well, running through the set-up in half an hour and establishing a long-term goal for the crew (a goal which seems to be increasingly forgotten as the show continues). There's some good laughs, but the low-budget sets (grey, grey and more grey) mean that it feels very cheap although, at great odds with contemporary British SF series like Doctor Who, the actual model shots of the ship itself are excellent and remain impressive. The cast is a mixed bag, consisting of a dancer (Danny John-Jules as the Cat), a stand-up poet (Craig Charles as Lister), an impressionist and voice-over artist (Chris Barrie as Rimmer) and a stand-up comedian (Norman Lovett as the ship's computer, Holly). They all bring great enthusiasm to their roles but their lack of experience come through in some scenes, particularly with Craig Charles who tends to shout most of his lines as if he's still doing a punk-poetry recital in a noisy Liverpool bar. As the season progresses, however, the cast seems to learn that less is more and they relax into their roles. The second episode, Future Echoes, sets up the future format of Red Dwarf quite successfully. A hard or at least semi-serious SF idea is introduced, in this case breaching the light barrier, and comic ideas are spun off from this concept. More groundwork is laid for the future as Lister gets some glimpses of how his life will turn out (some ideas of which are eventually explored and resolved in future seasons) and Chris Barrie deserves a round of applause for a scene where he has to perform the exact same scene twice with no effects trickery at all. A clever idea, well-explored. Balance of Power sees Lister and Rimmer's struggle for supremacy and rank reaching a new level when Lister decides to take the chef's exam so he outranks Rimmer and is an amusing episode. Waiting for God explores the history of the Cat race and Lister's position in their religion, but it's more vaguely amusing and a bit silly than genuinely funny or clever. Rimmer's speech about the Quagaars (an alien race he hopes who will appear and give him a proper body) is the episode's highlight. The premise of Confidence and Paranoia is completely daft - Lister contracts mutated pneumonia which makes gives his hallucinations solid form - but played amusingly. The season finale, Me 2, sees Rimmer joined by another hologram and the ensuing struggle for dominance is quite entertaining. Overall these are entertaining episodes, but there's clearly a lot of work to be done. The Cat in particular comes across as quite distant and even cold in these early episodes, not caring if Lister dies in one scene and cracking jokes during another tragic moment. It's true to the idea behind the character, perhaps (cats don't really care about people, only where their next meal is coming from), but it makes him hard to like. Many of Rimmer's character traits are set up in this season but until the finale he mostly comes across as pathetic rather than sympathetic or with pathos, which the later seasons manage more successfully. Still, all the ingredients for the series' later greatness are here in full, and watched in the knowledge of how fantastic this series gets later, Season I (Red Dwarf's seasons are numbered in Roman numerals for reasons never adequately explained) becomes more interesting in retrospect. First-time viewers may find themselves wondering what all the fuss is about, but I recommend them to stick with it as it does improve immensely in the second season. I usually forget to mention DVD extras, but in this case the DVD set is quite impressive. All six episodes have full cast commentaries, whilst there is a detailed documentary exploring how the series was created, written and produced and the immense problems Rob Grant and Doug Naylor had getting it on air. The extras are genuinely impressive and well worth a look. 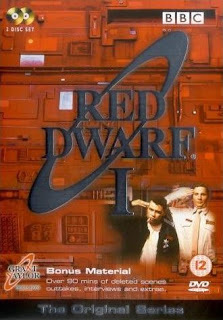 Red Dwarf: Season I (***) is available now on DVD in the UK and USA.